Leather Gothic bracelets hearken to the times of Medieval and Renaissance, when the Gothic movement was in its full glory. 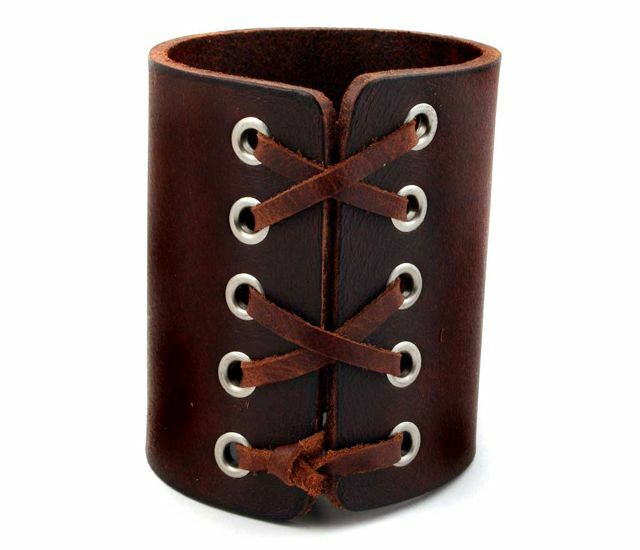 Leather Gothic bracelets are often the type that are a full cuff, and lace up with a leather string and several rivets being a part of its design. Other forms of Gothic leather bracelets have since evolved, but this is the most traditional design and hearkens to the Gothic period in history. The traditional type of leather Gothic bracelet sometimes has modern embellishments as a part of its design. Some are made from genuine leather while others may be made from synthetic leather or other materials but fashioned in the traditional cuff design. Sometimes embroidery, burned in designs, or metal may be additional embellishments. Most prefer the plain cuff with rivets and leather strapping to tighten and secure them. Of those featuring burned in designs, Celtic knot patterns, dragons, symbols associated with Gothic beliefs, or natural designs are often found. More elaborate cuffs with embroidery tend to mimic those that are burned into the body of the cuff. 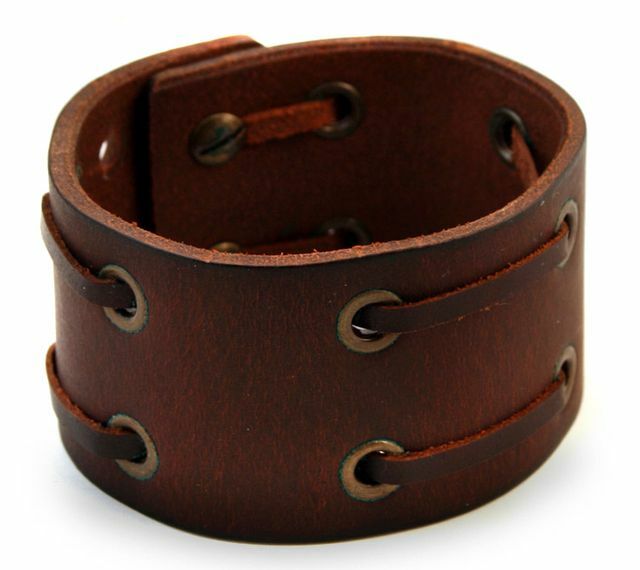 Of those leather cuffs featuring metal, most have protective metals such as steel, silver, or even gold around the edges to protect from wear and breakage. Sometimes more elaborate designs will incorporate a metal overlay design on the entire cuff. There are more than just the cuff design in leather Gothic bracelets. Some leather Gothic bracelets are very thin and feature the symbol as a part of the design. Bracelets that look like barbed wire are not uncommon. Less elaborate ones may be simply a strip of leather unto which a design of barbed wire is burned into. Some are simple leather straps with a metallic closure, often consisting of rivets and sometimes a stainless steel clasp. Leather Gothic bracelets with a more elaborate design or enclosure are often simple in appearance. Usually just a plain black or brown leather strap, the enclosure itself is often the decorative part. Some are made from sterling silver, but fancier ones are made with yellow or white gold or a combination. Leather Gothic bracelets made for women sometimes even incorporate colored gold as a part of the closure or the riveted design. Pink gold is the most common colored gold but there are other colors as well. Rivets can sometimes be added to the body of a leather Gothic bracelet to form a design. Leather Gothic bracelets are typically inexpensive. Even those with gold as a part of the enclosure or body of the bracelet tend to be less than fifty dollars in price, which is relatively inexpensive for jewelry. Leather Gothic bracelets can be hard to find. They are easily found in number and variety on the internet, but not so much in land based stores. 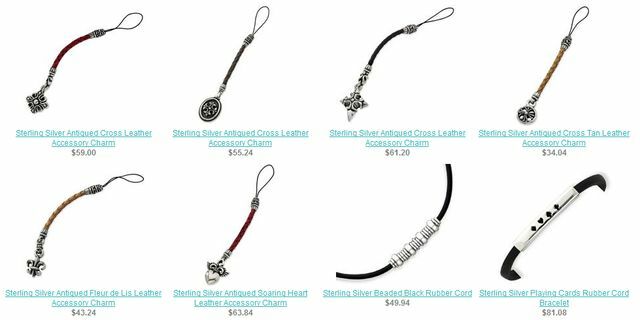 Land based stores that tend to carry leather Gothic bracelets are costume shops, leather stores, New Age stores, music stores, boutiques, clothing store featuring Gothic merchandise, and some novelty stores. They are not easily found, but can be a beautiful gift for someone else or accessory for one’s self.